Xorro-Q is a LIVE ("real-time") audience response solution designed to make presentations, lectures, conferences and lessons more involving. Xorro-Q enables participants in any audience to interact with a presenter's computer, using their personal browser-capable mobile devices: mobile phones, tablets, laptops or PCs. Use Xorro-Q to run quizzes, facilitate brainstorms, and formatively assess your audience by asking instant questions as you progress through a presentation or lesson. Xorro-Q provides insightful longitudinal reports on engagement and performance for every participant. The benefit for presenters and institutions is that Xorro-Q improves student retention in courses and achieves improved learning outcomes from groups. Institution managers receive deep insights into the audience experience, and participants report strong motivational value from using Xorro-Q in sessions. Xorro-Q has strongest applications in tertiary and secondary education as well as in any corporate setting where automated audience assessment is desirable. In addition, publishers and authors are using Xorro-Q to provide a game-like auto-assessment experience complement their e-books and articles. Xorro-Q’s motivational game-like approach is also helpful for distribution businesses seeking to influence and train their channel sales people. Xorro-Q is developed by Xorro Solutions Limited, a Manzana partner. Initiate and approve institution merge requests. Many administration functions are accessed through the drop-down profile menu which appears top right of the display once you are logged in to any xorro.com site. Only Institution Managers will be able to access "My Institution" and "Xorro-Q Institution Settings". Select "My Institution" to manage your institution's account, add or edit users, allocate Xorro-Q plans to users, change your Xorro-Q plans, and access institution-wide reports. From your profile menu, select "My Institution". The "Institution Dashboard" which appears gives you an instant view of institution-wide metrics, for all facilitators and all participants. On the left of the page you will see three menu groups: The top relates to your personal account; the second relates to the institution's account; the third provides access to Help. In the Institution's "Profile" you can edit the Institution details. Under "Users" you can view and edit all facilitator users in the Institution. You can add new users; you will be able to assign these Institution Manager privileges if required. Under "Licenses" you can access the institution's Xorro-Q license. Click on the "Allocate Users" button to selectively allocate your users to available Plans. You can click through to buy more Plans or extend your urrent ones as well. "Reports" provides a range of institution-wide reports on engagement. Select "Xorro-Q Institution Settings" to adjust how Xorro-Q is experienced by Facilitators and Participants across the entire institution. Participant Login Methods define how participants access activities run by facilitators in this institution. They can be set as defaults which a Facilitator can change, or they can be enforced. You can select the currency which will apply to any Fee Policies you might establish. In Xorro-Q, a "user" is a Facilitator (a teacher, a trainer, lecturer, presenter etc). This is the person who leads or orchestrates a group activity. Facilitator accounts can be set up in Xorro-Q by any Institution Manager. There is no limit to the number of user accounts which can be created in an Institution. The participation data collected by a user is accessible by that user and by Institution Managers. The following process describes setting up a User account. From your Profile menu (upper right of screen, dropping down from your login name), select “My Institution”. On left hand side of screen, select “Users” under your Institution name. On right hand side of page – click the blue “New User” button. Fill out the form. You must identify the username, first name, last name and email, and set a password. By default, the new user's position will be shown as "N/A" signifying norman Facilitator privileges. This may be elevated to "Institution Manager." Press "Register" at the foot of the form. Remember than a new user will not yet have any Plan assigned. By default, any user without a Plan assigned will be a Free Facilitator and therefore is subject to the Free Facilitator restrictions in use. To avoid this, assign a Plan to the user. In Xorro-Q, a "plan" is what enables a Facilitator to run live interactive sessions with groups. Plans can be assigned and re-assigned at any time. The arrangement is entirely flexible, to suit the changing needs of groups of facilitators. On left hand side of screen, select “Licenses” under your Institution name. On right hand side of page – click the blue “Allocate Users to the Latest” button. This will allow you to allocate your users to the most recently purchased licenses (if you have multiple license terms and wish to allocate users to future or older licenses, you may do so by selecting the grey "Allocate" button for each license). Move unallocated users from the left panel (“Free Facilitators”), into the desired panels on the right. There is a separate panel for each set of plans held by your Institution. If not enough plans are available, select user(s) from the right hand panels and press “Remove” to permit others to be added to a Plan. Login to your account at any Xorro page, eg: http.qf.xorro.com. From your Profile menu (drop down menu at top right of your screen), select "Profile" and then "My Profile" from the left hand column. Click the blue "Edit User" button. Change any details you wish in this form. At the foot of the form, put a check in the "Editpassword" checkbox to open the new password entry fields. Click on the blue "Update" button to save your changes. Most customers use a proxy server to manage internet access by clients from within their networks. Workbook and Alphateach require access to certain URL's in order to function correctly. In addition, it may be necessary to install a Flash Player plug (for access by Internet Explorer) for some operating systems, in order to view YouTube videos in Workbook/Alphateach. Setting how Participants access the activity. Assigning the activity to a Group determines how the results from the activity will be organised. If the activity is not set to a Group, then later analysis by group (eg by class or by course) would be impossible. Generally we recommend that this setting be set by default to force the selection of a Group for every activity when it is run. - "Selected Group Only": this locks the session access to only members of that group. Other ID holders cannot gain entry to the activity. This is frequently required, and in some institutions is the default access method. Be aware however that any participants not "enrolled" into the course, cannot access the activity! It is possible to set your groups up such that self-enrollment by participants is permitted. In this case, group-only access is the preferred access method. Workbook contains some features that take advantage of improved touch functionality in Windows 7, Windows 8 and Windows 10 (specifically, multiple simultaneous touch reporting, gestures such as puinch-scale and rotate, and scroll). For this reason some features will not be available on older versions of Windows. Workbook's open-hand-erase functionality requires the touch deevice to report touch size in the prescribed manner. If it does not then the touch size will not be detected and Workbook will not initiate an eraser for open hand touches. Customer, your user account in Xorro has been set up as a Xorro “Institution Manager" for Organisation. To access this Administrator functionality, login to any Xorro site eg http://www.xorro.com or http://qf.xorro.com, then use the Profile menu at upper right of screen to select “My Institution”. If you want to prepare an activity in advance, then go to http://qf.xorro.com (your home page), and visit the activities tab; go from there. You can get hints if you need them from http://www.xorro.com/help/61. If you don’t want to prepare, and instead just use Xorro-Q instantly in class, try our Q-Launcher toolbar (download Windows or MacOS) and use this in combination with your slide shows, videos, or just for brainstorming or class discussions. Download the Q-Launcher from your Xorro home page (login to http://qf.xorro.com, download links are on the right). See the on line guides, especially “Xorro-Q in 7 Bites”. Of course, please feel free to request help if you need it; we are only an email away! - Appropriate write access permissions to specific folders on the user's computer. The current version of the software may be obtained from http://update.xorro.com. Enter your Customer Key to download the latest version of the software to which your support subscription entitles access. If your support subscription has expired, you can continue to use older versions of the software and these should activate without problems. However, Xorro cannot maintain past versions of the software, so if there is any activation problem with an old version the only remedy available through Xorro, is to subscribe to support and access the latest version of the software. The activation process is tied to your Customer Key. If you use a different key, this may not work at all. If you do not know your Customer Key, please ask your dealer to help. The activation process involves an exchange of data between the user computer and Xorro's on-line activation server. This requires a live internet connection. As an alternative, activation can be performed off-line for a specific computer, by extracting data to create a code. A different device which is connected to the internet, is then used to send this code to the Xorro Server and obtain a response code. This response code can then be keyed into the user computer to complete the activation. Please check 'Ensuring Workbook connectivity across your network' to ensure Workbook / AlphaTeach can access relevant services and sites over the internet. Licenses for the software are often limited to a specific number of devices on which the software may be installed and activated. As devices are activated, the numberof possible future activations reduces. See Licensing of Workbook / Alpha Teach and Activating Workbook & Alpha Teach for details. The activation relies on being able to make and save changes to files in the C:\ProgramData\Alpha Teach folder (default location). If the files cannot be changed, or if this folder is subjected to being cleansed of any changes, then the activation may not succeeed, or may not be saved. Please ensure that ProgramData folders can receive changes ie are not read-only. There will be times you will want to limit the time avauilable for a participant to answer a question, or a set of questions such as a quizz. A timer is available for you to use on questions and on batches (of questions) in Real-Time activities only. On clicking "Set", the Timer Edit dialogue will appear. This lets you set the time permitted to answer the question. Either adjust the timer manually by using the + or - buttons above each digit, or choose one of the convenient 'presets' at the foot of the form. Press 'Set" to complete the process. Using Workbook (or AlphaTeach) with an interactive LED display or interactive whiteboard, they dot an 'i' or cross a 't', or just draw a very short hypen or dash on the canvas - and it does not appear on the page. The behaviour does not occur if using a mouse: the shortest of strokes, or just dots, appear OK on the Workbook canvas when made with the mouse instead of the touch device. - Hardware filters touches – All touch systems have filters built in to their firmware which are designed to eliminate noise. By noise I mean spurious touches: a touch signal which is not a “real” touch signal. Different suppliers adjust these filters for greater or lesser sensitivity depending on the market. (In Australia for example, we’re all aware of their problem with flying insects…. And being able to neglect the effect of a fly landing on the display without consequence to a human finger’s input, is of some advantage there!) The kind of filter which is of greatest concern is looking at the minimum “touch-down-and-drag” distance before a signal is passed as a “real” touch intention. Obviously, the drag component of this algorithm will impact on such real-world needs as placing a dot over an “i” or crossing a “t”…. - Hardware reduces touch sampling - In addition, the device “samples” the touches at a prescribed rate. This sampling rate may drop under certain circumstances – eg if the usb transmission bandwidth is inadequate, or if the device is instructed by a driver to drop its sampling rate. Obviously, reducing the sampling rate increases greatly the likelihood that a dot over the “i” or a stroke over the “t” is overlooked and not reported. - Connectivity – The interactive display’s connection to the computer (via usb cable in most cases) is a point of vulnerability. Every touch, every drag, every mouse action is communicated over this cable. In addition, the device may have to send other data over the cable, or the cable may also be connected to a hub and be handling data from other devices (eg video feeds) causing bandwidth constraints. USB is tolerant of noise such that a poor signal can simply mean less sampling of the touch gets through to the computer. In other words: if your usb cable is too long, or if there are several connection points (sockets etc), or there is some other source of noise, or there is too much data being sent over the one USB connection, then the available “bandwidth” is compromised and touch responsiveness will drop: ie not just lag, but also actual data loss occurs. One of the very first symptoms of this to the user is the inability to make short ink strokes or dots. - Computer & OS - Touch signals from your device pass through the usb port into your computer and are interpreted by Windows (or other OS) through a queueing system. Sometimes, if the computer is light on processing and there’s a lot of demand placed on it, then it can take some time for the queue of inputs to be processed. This generally presents as a delay and catch-up of mouse actions rather than as missing inputs (such as a missing ink dot or stroke). – So I doubt this is the issue! - Drivers - Drivers installed on the computerwill directly influence thesampling and filtering of touch signals. Sometimes a driver will reduce sampling rates or filter noise, perhaps in response to the bandwidth available for communications with the device. We see both responsiveness impacts and also filtering leading to data loss, resulting from drivers interpreting the touch signals. - Software – There are a few cases in which the application software’s design will impact on whether or not it acts on touch information being received. Efficient touch application software today will use the touch functionality built into Windows 7, 8 and 10 in preference to the standard HID (Human Interface Device) drivers used for mouse or other pointing devices. Workbook / Alphateach interfaces correctly with the native Windows touch functionality. The software will need to input the touch signals from the queue, and interface with drivers which control the touch device. When you set up LTI for your Institution so that Xorro-Q can exchange data with your Learning Management System, you will need to create a Consumer Key, and provide this to your LMS as well as a "shared secret". - At the bottom of that page, where “LTI Support” should be checked (to enable LTI for your institution), you’ll see a link to “Manage LTI Keys”. Follow this link to create or find your Consumer Key and the "Shared Secret" key. A frequent frustration expressed by Facilitators using Canvas to run Xorro-Q activitires (where Xorro-Q is selected as an external tool), is that they believe they cannot see what the students see. This article explains how to view a student's eye view of the assignment you have created and published through XCanvas. You are now in student view. It is made obvious by the pink frame. Student mode is obviously quite restricted (ie to what students can do). To exit and return to your normal mode, select “Leave student view” at the bottom of the frame. To create a Plus account, browse to q.xorro.com/PLUS. At the foot of the form, select "Get a Plus account". You will need to provide an email, first name and last name, and create a password. Submitting this data will then direct you to a payment page. On completion of the payment, your Plus account will work. If for any reason you do not complete your payment at this point, your Plus account will not function properly until your payment has been completed. In this case browse to q.xorro.com/plus and login using the credentials you created. You will be redirected to a Purchases page from which you can resolve a Pending Payment. The easiest and fastest way for a Participant to access his or her Plus account is by browsing to q.xorro.com/PLUS, and logging in using their Plus account login (usually an email) and their password. The participant can also go to this Plus account login page by following links from either the facilitator URL, or at the end of any activity (on viewing the Activity Results final page). On logging in to a Plus account, the participant will have the option of viewing their results history, or viewing their Plus account details and transactions. Selecting the first of these (view Results) will present the participant with a list of all past activity results, by Institution. These are listed in date order, with the oldest at the top of the list and the most recently added result at the bottom of the list. If the Participant has Results associated with more than one Institution, then a results list will be provided for each institution where institutions are ordered alphabetically. The results list displays (from left to right) the activity name, the number of attempts the Participant has made on this activity, and the best score from these attempts. Clicking on the activity name from within the list will direct the participant's browser to the detailed "best result" page for that activity. This is the same page which was reported to the participant on the completion of the specific activity result in question. Xorro-Q provides facilitators with options to provide participants with automated feedback to their responses at an appropriate time determined by the facilitator. These options are determined when the activity is being launched. The behaviour depends on the type of activity (real time, or self-paced). Fig.1: At left, the launch form when launching a self-paced activity from the QF site. At right, the same functionality when launching a selected activity using Q-Launcher (after expanding the "Options" section). When the facilitator is launching the activity the relevant "options for participants" are displayed on the launch form. Figure 1 (right) displays this form as experienced when launching an activity from the QF site, and when using Q-Launcher . Note that if Q-Launcher is being used, facilitator must expand the "Options" section on the launch form (after selecting the activity) to view these. Fig.2: At left, the "Waiting for Questions" form which is presented to the Participant devices when all questions have been completed or the batch has been stopped by the Facilitator. At right, the facilitator can opt to provide feedback after every question. This is presented in a form following every response submission by the participant to an assessable question. Selecting to "show participants their score during the activity" will ensure that the participants receive feedback immediately after submitting responses to each assessable question. This feedback is provided on a new page served to the participant device following their pressing "submit" for their response (see Fig.2). Te question feedback page also displays the participant's current total score and placement relative to others in the group. To progress to the next question the participant must press the blue 'continue' bar at the foot of this question feedback page. Fig.3: At left, the End-of-Activity screen displayed on the participants' devices when the facilitator has finished activity in which question feedback has been disabled. At right, the same screen when question feedback is enabled. If the facilitator has selected the second option "Show participant results at the end of the activitty", then when the facilitator ends the activity the participant screen will switch to a form which provides a link through which participants can access their full result set for the entire activity. If the first option as well as the second are ticked, then this final screen will also display the participant's score and placement from the last question (or question batch). Fee Policy editing is accessed through the Participants tab, by selecting the "Manage Fee Policies" button. Choose the Fee Policy which you want to edit (or create a new one). In the message section, enter the text which you wish to appear when a participant applies to enroll in the group. 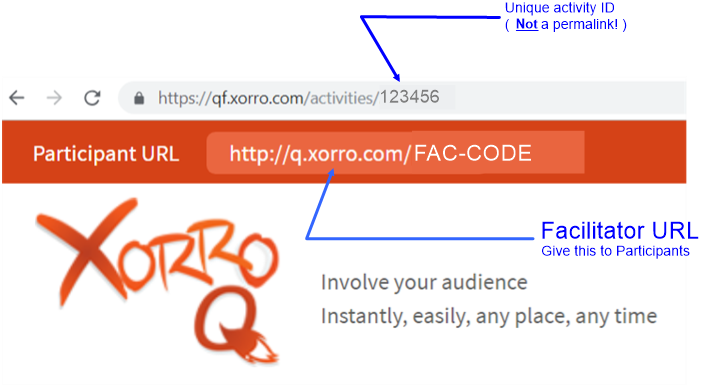 You can enter HTML code here to invoke a link; Xorro-Q will hide the HTML tags and interpret the code to display it correctly. "You are enrolling in the course "Fundamentals of Structures". Enrolment costs US$9.80. <a href="http://www.xorro.com/help">Click here</a> to view the course page." "You are enrolling in the course "Fundamentals of Structures". Enrolment costs US$9.80. Click here to view the course page." A core concept in Xorro-Q is that a Facilitator “runs” (or "starts") an activity, which is then "owned" by that Facilitator. Any Results (ie participant responses) associated with that activity can only be seen by the Facilitator who ran it. This is to protect participants’ data. Another core concept is that a Facilitator can only have one real-time activity running at a time. This is because the Facilitator is required to actively launch any questions or batches in a real-time activity. It would not make sense to have the Facilitator doing something else! The above constraints can can lead to some issues where multiple facilitators are co-managing a course of study (ie a "group" for Xorro's purposes). Specifically: where an activity has been started by one Facilitator, only that Facilitator's login can be used to access participants' results associated with that activity. Also, only that login can edit or manage that running activity. To get around this, sometimes a shared Facilitator login is used where it is desirable to have multiple facilitators able to simultaneously manage an activity ( and view results). Being logged in to the same running activity using the QF.xorro.com site, multiple facilitators (using the same login) can successfully coordinate their efforts. Naturally, any action taken by any user of the same Facilitator login has equal weight and will be acted upon! Where a first Facilitator starts a real-time session using Q-Launcher, subsequent facilitators (using the same login) can browse to the QF.xorro.com page and access the Running Activity. Where a first Facilitator logs in to the QF.xorro.com site and launches a real-time activity from there, and then a second Facilitator (using the same login) opens Q-Launcher, the second facilitator will receive the following alert: "There's a running activity associated with this account. Do you wish to continue this activity? " There are two options offered: "Yes", and "Close activity". If the second facilitator chooses "Yes", the Q-Launcher session will join the session created by the first facilitator. If on the other hand the second facilitator chooses "close activity", the first facilitator's session (launched from QF.xorro.com) will be closed and the Q-Launcher session then becomes the running real-time activity. I have ordered and paid for some Xorro Workbook licenses. What next? If you have ordered Workbook (or Alphateach) licensing from our web store and have asked to be invoiced, then you will receive your invoice and an order confirmation by email. At this stage your order is on hold until your invoice is paid. If you have any problems in concluding the payment process please contact us on sales@xorro.com. Once payment is received, we will update your account details. You will then be able to use your Customer Key to activate the software. You can of course download the software at any time from http://update.xorro.com. This will work as a fully functional 30 day trial. Activating the software using your Customer Key will enable its ongoing use beyond the trial period. Your Facilitator account is secured to your Institution, so it cannot be "moved" as such. However there are means by which you can transfer specific content to a new account in a new institution. This article offers some suggestions on this process. Do not be tempted to open a second Free facilitator account within your (old) institution Xorro account but using your nrew institution email. Whilst this will work, it will create quite a few headaches for you and others. Most importantly, any groups you create will be visible to other Institution Managers (IM's) at your old institution, and this means that their memberships (your new students) will also be visible to those IM's. Although their activity responses ("results") and grades etc will not be visible to others, they are being bundled into the "wrong" institution account which technically means you would be sharing your students' data with a third party. Furthermore, you would still be treated as a member of staff from the old institution so you would have access to their groups (and student lists) and any resources shared within the institution. The correct path to take is to join your new employer's Xorro account (if they have one), or set up a new account. - you can create your own Free Facilitator account and while doing this select your new institution. This will send an automated request to all IM's to approve your joining the institution. This still allows you to start using Xorro-Q immediately but you will noty have access to your new institution's other groups, shared resources etc until your request is approved. If your new employer does not yet have a Xorro account, then you can easily set up a new institution account for them (with you in it as a Free facilitator and Institution Manager). Global sharing from your old account: Login to your old account. Go to the Q-Bank tab, and import any questions you want to to access in future from your old activities (see: How can I import quantities of questions into Xorro-Q?). Make sure to tag these question as you import them, with relevant tags which will make it very easy for you to find them later (often the original activity name can be a helpful tag). Also make sure to set sharing level to Globalso that the questions can be "found" from another institution. Accessing from your new account: Now login to your new account (in the new institution). In Q-Bank, you can run a Global search for the tags you created earlier, to find the questions you imported. If you want to use them in an activity the best way is to create the activity in the usual way, then click on "Import questions" button and perform the (global) search and select process. This brings a copy of the selected questions into your new Facilitator account. Stop global sharing: If you want to stop sharing the questions, you will need to log back into your old account. Set the search Scope to "Mine" or "Institution", not "Global". Search for the tags you used, and select the questions you want to stop sharing. Once you have made your selection, you will be able to select "Edit Metadata" button at the top of the question list; in the "Share to" field select "Mine". This retracts the global sharing for the selected questions. Deleting your old content: If you want to delete the questions you can do so by deleting the original activities in your old account. This will not affect any copies you may have created in your new account. If your questions were "asked" of participants at any time (and responses were offered), then these "Results" (including a copy of the originally asked questions) cannot be deleted. To change the choice of default page size and orientation: Go to the Tools>Options menu. The first tab allows change of the default page size and orientation (there are many other behaviours and user presentation parameters which can be set in this and other tabs). These settings will apply to the curent session but will not be retained after the document is closed unless the document is saved. The act of saving the document will apply the chosen values to become defaults for any new documents. To change the choice of default font and font colour: In any document, add a "Text" button to your Personal Toolbar. Right-click on the button to set its properties. Select the desired font and font colour for the default font and font colour. Then type some characters onto the document and confirm the settings are as desired. Once happy, you must save the document to apply the settings as defaults. (You can always deleted the saved document later). Note that these locations may differ if your software has not been installed using the default Windows folder destinations. The lines which relate to the initial font settings are those indicated above in red. Make sure that you use the font name precisely as it appears in your fonts directory. Save the file making sure not to retain the .ini extension. Then close and re-start Workbook (AlphaTeach) to observe the new setting.. If an activity can be accessed only by members of a group which is subject to a fee policy, then all members of that group will have Plus accounts. 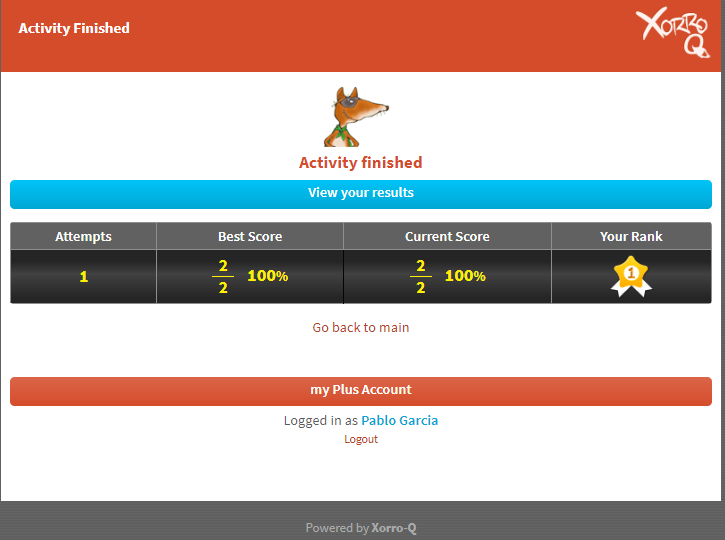 With a Plus account, the participants can view their personal results history: In other words, they can see a log of all of their past attempts on Xorro-Q activities; they can see an instant summary of their score; they can also drill into the linked activity result to view the individual question response data..
1. Log in directly at q.xorro.com/plus. Upon logging in, select "View Results" from the menu. 2. At the end of every activity, the Participant will see an "Activity Finished" page summarising their responses to that activity. In the case of a participant with a Plus account, they will see a button linking them to their Plus account (see image). This will take them to the Plus accounts login form at which they must login, then select "View Results" from the menu. What is the purpose of peer assessment? The ability to give and receive constructive feedback is an essential skill for team members, leaders, and managers. Consequently, your teacher has chosen to use Peer Assess Pro™ to help you provide developmental feedback to your team members, for both formative and/or summative purposes. The goal of developmental feedback is to highlight both positive aspects of performance plus areas for performance improvement. The result of feedback is to increase both individual and team performance (Carr, Herman, Keldsen, Miller, & Wakefield, 2005). Additionally, your teacher may use the quantitative results calculated by Peer Assess Pro™ to determine your Personal Result for the team work conducted by your team. Your Personal Result may contribute to the final (summative) assessment grade you gain for the course in which Peer Assess Pro™ is applied. Peer Assessed Score, a measure of the relative contribution your team members assess that you have made to the team’s delivered outputs, teamwork processes, and/or leadership of the team. Leadership and Team Processes. Contributions such as focussing the team on priorities, encouraging and welcoming the contributions of others, managing conflict, and chairing meetings productively. The selection of the criteria used in the Peer Assess Pro is reinforced by the results from a recent survey that asked employers to rate the importance of several competencies they expected to see in new graduates from higher education. The figure shows that teamwork, collaboration, professionalism, and oral communications rate amongst the most highly needed ‘career readiness’ competencies sought by employers. 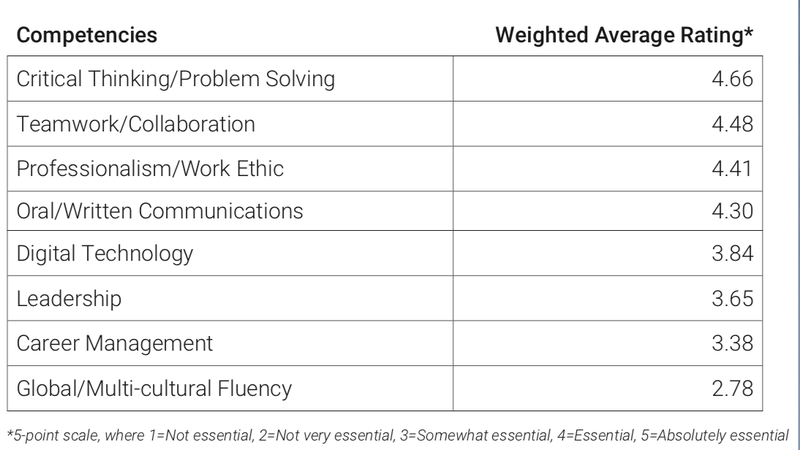 All these competencies rate at least as ‘Essential’, with Teamwork and Collaboration rating almost Absolutely Essential (National Association of Colleges and Employers), 2018). Source: National Association of Colleges and Employers (NACE). (2018). Figure 42, p. 33. What is the Purpose of Peer Assessment? What questions are asked in the peer assessment survey? How are peer assessment and personal results calculated and defined mathematically? How is the Peer Assessed (PA) Score calculated? Running Peer Assessments from Xorro-Q Importing Participants, Teams and Groups How do I view or correct the Team Composition in a running peer assessment activity? How do I decide on which Personal Result method to apply in my peer assessment activity? Deacon Carr, S., Herman, E. D., Keldsen, S. Z., Miller, J. G., & Wakefield, P. A. (2005). Peer feedback. In The Team Learning Assistant Workbook. New York: McGraw Hill Irwin. What questions are asked in the peer assessment survey? The Peer Assess Pro survey measures one overall assessment, Recommendation, followed by ten quantitative ratings, then several qualitative questions. The ten quantitative ratings are used to calculate the Peer Assessment Score (PA Score). The ten ratings are categorized into two classes: Contribution to Task, and Contribution to Leadership and Teamwork, as shown in the example survey below. In addition, two qualitative questions are asked that request examples of behaviours supporting the quantitative ratings in relation to Contribution to Task, and Contribution to Leadership and Teamwork. Finally, the assessor is asked to provide Development Feedback. That is, advice that would help the team member improve their future contribution to the team. What is the Purpose of Peer Assessment? What questions are asked in the peer assessment survey? How is the Peer Assessed (PA) Score calculated? How are peer assessment and personal results calculated and defined mathematically? Running Peer Assessments from Xorro-Q Importing Participants, Teams and Groups How do I view or correct the Team Composition in a running peer assessment activity? How do I decide on which Personal Result method to apply in my peer assessment activity? How do students know where and when to complete the peer assessment activity then review their results? How likely is it that you would recommend this team member to a friend, colleague or employee? Rate the team member on a 5-point scale. Rate your typical or average team member a mid-level rating of 3. Shows initiative by doing research and analysis. Takes on relevant tasks with little prompting or suggestion. Prepares for, and attends scheduled team and class meetings. Makes positive contributions to meetings. Helps the team achieve its objectives. Work is of professional quality. Contributes ideas to the team's analysis. Helps my learning of course and team project concepts. Keeps team focused on priorities. Facilitates goal setting, problem solving, and task allocation to team members. Supports, coaches, or encourages all team members to contribute productively. Listens carefully and welcomes the contributions of others. Helps the team work in a harmonious manner. Demonstrates effective leadership for the team. For the team member you have assessed, provide specific examples of productive or ineffective behaviours related to your ratings of Contribution to Leadership and Team Processes. For example: keeps team focused on priorities; supports, coaches and encourages team members; listens carefully; manages conflict effectively; demonstrates effective leadership. What specific behaviours or attitudes would help your team member contribute more effectively towards your team's accomplishments, leadership, and processes? Please provide specific positive or constructive feedback that could enable the team member to improve their behaviour productively. Considering your team member's strengths, how could that person coach other team members to acquire similar strengths for Task Accomplishment, Team Processes, and Leadership? Source: Peer Assess Pro (2019). The choice of calculation method for determining a team member’s personal result is determined by the teacher's preference for compensating more strongly team members who have contributed significantly to their teams, and under-rewarding team members who are peer assessed as weak contributors. The figure illustrates the statistical features, such as team average, range, and standard deviation, associated with each method. The teacher can select either the Peer Assessed Score (PA Score) or Peer Assessed Index (PA Index) if they wish to exclude a team result in calculating the Personal Result (PR). More usually, the Peer Assessed Score and Team Result (TR) are combined mathematically to produce a Personal Result. There are three alternative methods. As the figure illustrates, the Indexed Personal Result (IPR) is the least discriminating method, whilst the Rank-Based Personal Result (RPR) is the most discriminating in terms of favouring significant team contributors and penalising weak contributors. Most teachers select the Normalised Personal Result, often with a spread factor of 1.5 to 2.0. In contrast to the graphical illustration earlier, the following table summarises the example calculations presented through a series of FAQ that present the mathematical definition and example calculations for each method. Source: FAQ: How are peer assessment and personal results calculated and defined mathematically? A relative measure of the degree to which a team member has contributed to their team's overall achievement, team processes, and leadership. The Peer Assessed Score (PA Score) is calculated for each team member directly from their Average Team Contribution (ATC) and Average Leadership Contribution (ALC). That is, from the ten components of Team and Leadership contribution survey in the peer assessment. A Peer Assessed score is generally used to compare the relative contribution of students WITHIN the same team, rather than BETWEEN teams. The Team Result has NO impact on the value of the Peer Assessed Score. Values for the PA Score range from zero through 100. The Peer Assessed Score (PA Score) is indexed upwards so that the person in the team with the highest Peer Assessed Score is awarded a Peer Assessed Index of 100. All other team members receive a proportionally lower PA Index in the ratio PA Score / max(PA Score). The Team Result has NO impact on the value of the Peer Assessed Index. The result awarded to the team for the outputs of their work. The teacher typically derives the Team Result (TR) from grades for team reports, presentations, and results of Team Readiness Assurance Tests. The teacher may select to combine a student's Peer Assessed Index (PA Index) with their team's Team Result (TR) to calculate a Personal Result (PR) for each student, reflecting their relative contribution to the Team Result as assessed by their peer team members. Peer Assess Pro enables the teacher to select from several methods to combine the Team Result and Peer Assessed Index (PA Index) to produce a Personal Result: the Indexed Personal Result (IPR), the Normalised Personal Result (NPR), and the Rank Based Personal Result (RPR). A student's personal result gained from combining their Peer Assessed Index (PA Index) and, optionally, their Team Result (TR). The teacher selects from one of several Calculation Methods to calculate the Personal Result that incorporates the Team Result. These methods are Indexed Personal Result (IPR), Normalised Personal Result (NPR), and Rank-Based Personal Result (RPR). The choice of method is determined by the teacher's preference for compensating more strongly students who have contributed significantly to their teams, and under-reward students who are peer assessed as weak contributors. Figure 1 illustrates the statistical features, such as team average, range, and standard deviation, associated with each method. The IPR is the least discriminating method, whilst the RPR is the most discriminating in terms of favouring significant team contributors and penalising weak contributors, as the figure illustrates. The Indexed Personal Result is calculated from the Team Result (TR) combined with the student's specific Peer Assessed Index (PA Index). The Indexed Personal Result method awards the Team Result to the TOP RATED student in the team, since, by definition, their Peer Assessed Index is 100. All remaining students in the same team earn the Team Result downwards, directly proportional to their PA Index. The Indexed Personal Result calculation means that NO team member can earn an Indexed Personal Result greater than the Team Result. That is, values for the Indexed Personal Result range from zero up to the Team Result. The Normalised Personal Result is calculated from the Team Result combined with the student's specific Indexed Personal Result (IPR). However, in contrast to the IPR method, the Normalised Personal Result method awards the AVERAGE student in the team the Team Result (TR). All remaining students are awarded a Personal Result ABOVE or BELOW the Team Result depending on whether their IPR is above or below that team's average. Features of the Normalised Personal Result are that (a) In contrast to the IPR method, the Normalised Personal Result method calculates a Personal Result ABOVE the Team Result for the above-average peer rated students in the team (b) The average of the team's Normalised Personal Results matches the Team Result (c) The spread of the team's Normalised Personal Results matches the spread of the Indexed Personal Results (IPR) that is calculated for that team. Spread is measured by the standard deviation statistic. . Optional feature: To enhance the effect of rewarding high contributors and penalising weak contributors the tutor can increase the Spread Factor (SF) from the default value of 1.0. Increasing the Spread Factor increases the spread of the results centred around the Team Result. However, an increase in the Spread Factor will maintain a team average NPR that matches that team's Team Result. A Spread Factor of 1.5 to 2.0 is recommended, especially in classes where team members are reluctant to penalise weak contributors and/or reward the highest contributors through their peer assessment rating responses. The Rank Based Personal Result is calculated from the Team Result combined with the student's specific Rank Within Team based on that student's Peer Assessed Score. Like the Normalised Personal Personal Result the RPR method awards the AVERAGE student in the team the Team Result. All remaining students are awarded a personal result above or below the Team Result depending on whether their Rank Within Team is above or below that team's middle-ranked student. Features of the Rank Based Personal Result (PR) calculation method are that (a) A team's RPR values are spread over a MUCH WIDER range than the NPR and IPR methods. Small differences in PA scores within a team are amplified significantly by this method (b) In contrast to the IPR method, the RPR method calculates a Personal Result significantly ABOVE the Team Result for the top ranked student in the team (c) Like the NPR method, the average of the team's RPR values matches the Team Result. Values for the Rank Based Personal Result range from zero to 100. Calculations that exceed these ranges are clipped to fit within the range zero to 100. How do I view or correct the Team Composition in a running peer assessment activity? Note: DO NOT adjust the contents of the Column headed ‘group_code’ in your CSV file. The Peer Assess Pro Activity will continue. All students in teams affected by a change in composition will be notified by an automatically generated email to resubmit their peer assessment responses. Reason: They now have different team members to rate. The remaining teams of the class will be unaffected. Save time and effort when you download complete gradebooks or have them automatically applied into your LMS. If you don't know anyone at your organisation who is already using Xorro-Q, then sign up as a Free Facilitator. If your organisation is already using Xorro-Q, one of the Institution Managers can add you as a Free Facilitator to the account. To sign up as a Free Facilitator, complete the short form at www.xorro.com/free_accounts/new. You'll need to enter your first and last names, your email address, and you'll need to choose a username and password for your account. Your username just needs to be unique; some people use their email address as a username but any unique alphanumeric string will do so long as it uses ordinary characters and has no spaces or punctuation. Your password is case sensitive (but username is not). As you start typing the name of your organisation into the field, Xorro will list any institution accounts which have similar names so you can choose one of these if appropriate. If your organisation is not among those listed then select "Create a new organisation" to create your new institutional account in Xorro-Q. If you selected one of the listed organisations, your account will be set up initially as a fully-functional stand-alone institution. Your details will be sent as a "merge request" to the institution managers for the account you chose, asking them to approve a merger of your new institution account with the chosen account. Until they approve, you will not have access to data from the other facilitators in the institution (such as group and participant lists, shared resources etc). Free Facilitators have generous limits to what they can do in Xorro-Q. However, if you are running a large group and need to use Xorro-Q intensively, you will want to choose a Facilitator Plan, or consider a Participant Funded model. If a merge request is not answered then the source and target institutions proceed as before the request was made, ie without any impact whatsoever on either. Merge requests do not have any definitive expiry. - Give participants your Facilitator URL. If you have other (self paced) activities running at the same time, participants will then need to press the blue "Live Session" button. - Display the QR code (either from Q-Launcher, or from the running page on your QF site). This will take participants directly to your running Real Time activity. - If you have created an "activity permalink" for this activity, give the permalink to your participants. Important note: When an activity is created, a unique id is generated for this activity. This id is used to access the activity during editing. When the activity is run, a copy of the activity is created along with a new activity id which is then used in an activity url to access the running activity. This permits changes to the original activity to be saved without corrupting the running activity's results. Using an "activity permalink" allows a Facilitator to automatically replace a running activity with a changed version of the activity. The participants will experience this seamlessly, however a new Results set will be generated. What is my Facilitator URL? Your Facilitator URL (also called the Participant URL) is displayed at the top of your QF site's pages (see image at right). It is also displayed at the top of the Q-Launcher application. A: Download and install Q-Launcher, and use it to start an activity and ask "Instant Questions." 1. Download the Q-Launcher desktop toolbar from http://qf.xorro.com/pages/xorroq_launcher, and install this (versions are available for either Windows or Mac OS). 2. At the start of class, double-click the Launcher icon (Fox) and login as a Facilitator. Choose the Group (if you have created one – if not, just accept the default settings), and press "Start". 3. Click on the Fox at the top of the toolbar, to collapse the toolbar to a tile; drag the tile to a convenient location on your desktop for later access. Start your presentation. 4. Whenever you want to ask a question of your audience, just click on the Fox tile to expand the toolbar, and select the question type (multi-choice or text response). Either specify the "Login Type" and "Group" for this Activity, or else leave this open (as it can be specified later when launching the Activity). 4. Add questions to suit. 5. In the case of a Self-Paced Activity, when launching you will need to specify the date and time of starting and ending the activity (defaults use the current date and time to start). A: You can either launch it from the QF site (select the activity and select "Run" from the left hand menu), or else you can open Q-Launcher on your desktop, log in, then select the activity and start it. A: Self-Paced activities cannot be started from the Q-Launcher; you must start it from your QF site (log in, select the activity, launch or run it). Any Facilitator can create activities, and also can share activities with other Facilitators – either in the Institution, or else Globally. If another facilitator opens a shared activity, then that activity becomes a clone of the original – meaning the second Facilitator can edit and change without altering the original shared activity. In the "Activities" tab, click on "Shared Activities" from the left hand menu to see a list of activities shared by other facilitators in your institution. Download the Q-Launcher desktop toolbar from http://qf.xorro.com/pages/xorroq_launcher, and install this (versions are available for either Windows or Mac OS). At the start of class, double-click the Launcher icon (Fox) and login as a Facilitator. Select the pre-prepared activity from the list. Choose the Group (if you have created one – if not, just accept the default settings), and press "Start". Click on the Fox at the top of the toolbar, to collapse the toolbar to a tile; drag the tile to a convenient location on your desktop for later access. Start your presentation. When ready to "ask" (or launch) a question or batch, click on the Fox tile to open the toolbar. Select the desired question or batch from the thumbnails arrayed at the foot of the Q-Launcher. Select "Start". Select "Default Login Type" and "Default Group" to assign the activity to a specific group of participants and click "Launch"
When you have "run" an activity (a set of questions) with participants, and responses of some sort have been received from the participants, Xorro saves the outcome as a "Result". (Note: If no responses have been given by participants, then of course no "Result" is saved). Results, therefore, are the convergence of an Activity (ie the question set), with an event (ie date and time) and with a set of participants (who may or may not be pre-registered in a "group"). To find and explore your Results, browse to the Facilitator web site: qf.xorro.com. From the "Activities" pane on the left side select "Results"
Results can be selected after sorting on the basis of "Name" and "Newest"
Select the desired result or results from "Results"
A: Yes: Every User (educator, presenter etc) has a unique "Facilitator URL". This is the URL at which that user's activities are available to participant browsers. The URL does not change for that user. The QR code directs a participant to this URL. A: By selecting a Group, results from the activity are tagged to that group. Hence, attendance data is captured and can be analysed. If no group is selected, there is no basis for determining the potential enrolment in the session. Furthermore, engagement histories for groups can only be determined if the data is tagged to the group in the first place. A: Firstly, the Participant experience will be a little different. If a participant logs in to an activity and then later closes their browser, on re-entering the activity they may not be recognised as the same participant and therefore the total participant count will increase (this is dependant on the participant's device). Secondly, there are significant implications for data collected. Obviously, there is no explicit way of linking an alias to a real person. Xorro-Q treats an alias as specific to an activity, so there is no linking of aliases across activities. Lastly, since an alias is not identified as a member of a group, alias logins cannot affect group engagement data. A: Use an "alias" login, and tell participants to use a "Nickname" which does not identify them. A: Real Time refers to synchronous teaching, where the facilitator and the Participant are "present" (ie logged in) at the same time. You'll use this feature if you want to actively manage the session while it is running, eg by launching new questions or batches or reacting to participant contributions. A facilitator can only ever have one Real Time activity running at once, but there is no limit to how many self-paced activities can be run concurrently. Self Paced activities are designed to be run without the facilitator being logged in. The Participant simply processes the activities entirely in their own time. Otherwise, there are no differences. A: You can choose to permit the Q-Launcher to take a screen capture of your display at the instant you press any of the Instant Question buttons. This screen capture is saved with the audience responses. On reviewing the Results after the activity (you will have logged into your QF site and selected the appropriate Result under the Activities tab), look at the results for the question in the Question Report. You will see the screen capture in the space normally reserved for the question image. A: You can drag-and-drop Q-Launcher displayed Results onto any paste-ready context (eg Word, or Excel, or a whiteboarding program etc). Unfortunately, slideshow presentations do not accept a paste command when they are in slide show mode. They do, however, when in edit mode – so you could choose to exit slide show mode, so that the slide is in edit mode, and then drag-and-drop into the slide in question. A: Yes. If using Q-Launcher, you will be prompted on exit, whether you want to download ("export") the session data; if you do so then the data will be downloaded to your computer as a zip file containing two reports in both CSV and HTML: format – ie four files in total. If you choose not to, or if you are using the QF site for running your activity, then in any case the Results are always available to you from within the Activities tab – filter by "Results" (select filter from left hand side). A: In your QF site, select the Q-Bank tab. Select "Import from CSV". Download a sample file, and manipulate your source to ensure the data is in the same format. A: By default, any questions in your Q-Bank are stored as "Mine". This means they are not shared with anyone else. If you choose to, you can select question from your Q-Bank and share them either with others in your institution ("Institution"), or with all users of Xorro-Q around the world ("Global"). When searching for questions, the same principle applies, you can search within your own Q-Bank, or within Q-Banks from around your Institution or Q-Banks globally. A: Questions attract copyright. If you have sourced your questions from a third party, you should check what copyright is available for these. If they are free to share with other facilitators in your institution, then share them across the institution – global users will not see them. A: Login to your QF site. Near the upper right corner of your display, you will observe your name displayed as a button. Hover over this to see the drop-down menu. Select "Profile". This will take you to a personal dashboard of your key data. You'll see Reports are available from the menu on the left. A: "Initiating" refers to participants who have logged in to your session, but who have answered less than 20% of the questions you have posed. This could be for a number of reasons: language barriers, lack of confidence, distractions, not understanding your question, etc. In the Engagement Analysis, you can determine what proportion of your audience remains engaged. We suggest that you consider strategies for maximising the Engaged proportion (that part of the audience which answers 80% or more of questions asked of them). A: In Xorro-Q, "Attendance" is determined by the participant logging in to an activity. Thus, a person may be present physically but cannot "attend" the activity unless they have a browser and have logged in. Certain circumstances can lead to very low attendance values. Using mixed login types (ie where both alias and id are allowed) has the effect of reducing attendance, since alias logins cannot be recorded as group members. Another in-class practice which will distort the attendance data greatly is creating additional participants to act as a "sub-group". In this case, the majority of the class will not be logging in to activities as individuals when these "sub-group" participants log in, and therefore the non-attending level to these group activities will be very high. It is recommended instead to create real groups and assign the activity to those groups in such a case. A: Check the top right hand corner and see if there is a message indicating that you do not have a current Facilitator License. If you are using a Free Facilitator plan, then you will be restricted to asking no more than 100 questions per month, of audiences of no more than 33 free participants.. In order to be able to run a larger session, or to ask more questions, you need a Facilitator Plan assigned to you. Your Institution Manager is able to selectively allocate Facilitator plans to users through the "Licenses" section in the Dashboard menu. A: Check the Glossary of Terms. A: Yes. Check the Import Participants function in the Participants tab. You will need to create a CSV file which includes the participant once for every group in which that participant is a member.